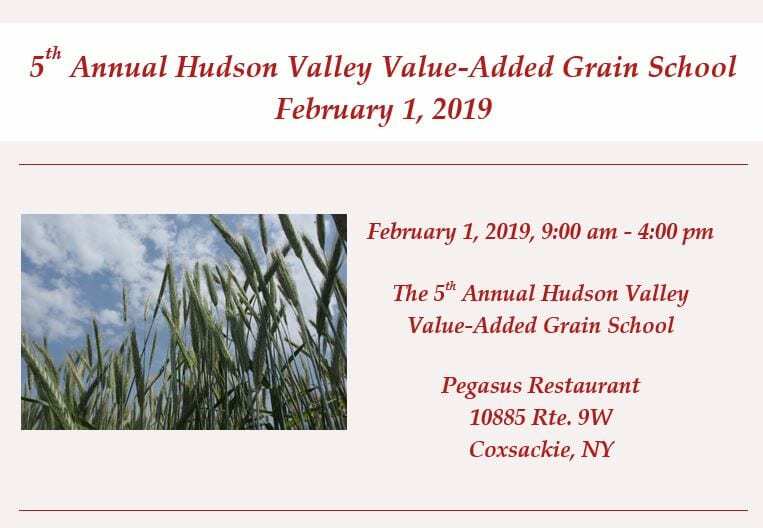 This year, the Hudson Valley Value-Added Grain School’s focus is on accessing and developing markets for value-added grains, with topics to include current grain market sectors and their quality requirements, developing direct markets to consumers, developing a grain-processing enterprise, distribution strategies, accessing capital, and marketing tools. An extended panel discussion in the morning will feature representatives from the milling, malting, distilling, and feed sectors. Afternoon sessions will feature presentations by small- and larger-scale grain-processing enterprises. This meeting is sponsored by Cornell Cooperative Extension (CCE) and the Organic Growers’ Research and Information-Sharing Network (OGRIN). Register at https://tinyurl.com/hvgrains2019 by 5:00 p.m. January 29 for $40, or $60 after January 29 (registration includes lunch). · Mark Fischer who, with his wife Fran, produces stone-ground wheat and specialty flours (rye, spelt, emmer) and corn meals from grains purchased from local and regional farmers at a restored mill (est. 1730) in Doylestown, PA. Castle Valley Mill (http://castlevalleymill.com/) sells to bakeries and restaurants and to consumers through retail outlets and an on-line store. · Scott Morgan (http://morganicsfamilyfarm.com) who grows and processes grain on his organic farm near Hillsborough, NJ, for direct sale to consumers. He currently produces raw rolled oats, wheat, einkorn, and barley and is experimenting with pulses. · Brad Estabrooke, of Breuckelen Distilling (https://brkdistilling.com) who has been making craft spirits “from scratch” using New York grown wheat, rye, corn, and barley since 2010. · Dennis and Jeanette Nesel, of Hudson Valley Malt (http://www.hudsonvalleymalt.net), an artisan craft malthouse in Germantown, NY, who are passionate about buying only local grains and malting them for local brewers and distillers. · Vince Bruno of Bruno Farms Custom Feeds (Hudson, NY), who since 1995 has grown and purchased local grains to make custom feeds for livestock owners in the region. · June Russell of GreenMarket/GrowNYC, an expert on value-added grain markets and an innovator in grain distribution. · Lauren Melodia of the Center for Agricultural Development and Entrepreneurship (CADE) who has developed a marketing toolkit for farmers for value-added products. · Elizabeth Dyck (OGRIN), an organic researcher specializing in the production, processing, and marketing of value-added grains.